All the stars were lined up for Mr. Tony Stewart. No one was going to deny him his vicotry at Indy. 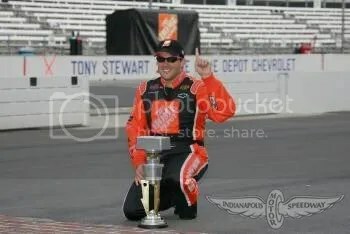 He fulfilled a life long dream of his by winning the Allstate 400 at the Brickyard yesterday in Tony Stewart style. With that victory and along with the misfortunes of Jimmy Johnson, Stewart is now at the top of the mountain. CONGRATULATIONS MR. STEWART!!!!! ENJOY THIS VICTORY!!!! !